Years ago, I faced one of the most awkward tests of my young life. After my relationship of twelve years came to an end it was hard. Naturally it was a difficult situation for me as it would be for anyone. It got hard when it was time to head over to the family's house for the holidays. For years and years, there was always a second person by my side. Someone who helped me get through these gatherings and keep me company. I was also kept safe because it always took an ungodly amount of booze to make it through these celebrations. So, here I was feeling young, exposed, and like a failure at life. In the end, it was easier than I thought. There was no surprise as to why I arrived and left alone. As sure as we are the sun will rise in the morning, it's also just that certain as a new year comes, so does a new Left Lane Cruiser record. 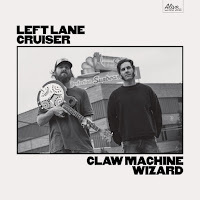 Here's an amusing little anecdote, on their last three records, Left Lane Cruiser have had three different line ups. Master Freddy has been consistent throughout and Pete Dio (Drums) certainly can't be faulted for not appearing on Beck In Black as it was a collection of unreleased tunes. 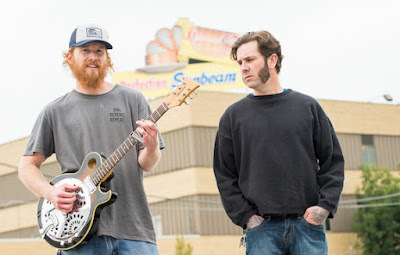 So here we are back to the duo format again with our cruiser friends and there's a different, more familiar, focus on the tunes like we're used to. After having lived with Dirty Spliff Blues for a few years, it hasn't held up as well as I'd hoped. So getting back to basics was a welcome change. It's nice to have the rednecks back rather than the hippies...if you catch my drift. Where there's smoke and all that. There's also some keys along the way...they sound like a man we all know, but as there's no confirmation on my end, you'll just have to guess. Left Lane Cruiser have reinvented themselves as their nearly original selves with spectacular results.